While we were waiting for the "Retina" MacBook Pro to arrive, we kept ourselves busy testing various USB 3.0 drive enclosures connected to the USB 3.0 ports of the 'mid 2012' MacBook Air. Then, for perspective, we threw in results for USB 2.0, FireWire 800, eSATA, and Thunderbolt enclosures. Our goal was to put USB 3.0's real-world transfer speed in context with other interfaces. 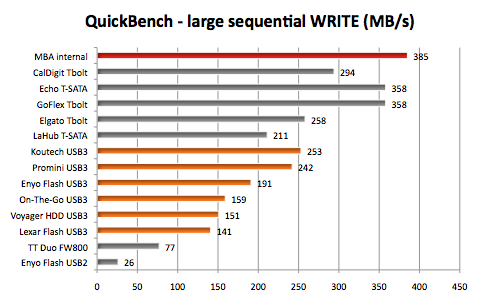 Unless otherwise noted, all "6Gb/s SSDs" were OWC Mercury Extreme Pro 6G SSD. I know there's a lot to consume in the above graphs. To summarize, USB 3.0 is dramatically faster than USB 2.0 and FireWire 800, but not as fast as T-SATA, SATA, and Thunderbolt storage solutions. There's a lot of USB 3.0 enclosures to choose from but our graph shows that, in terms of performance, they are not all created equal. 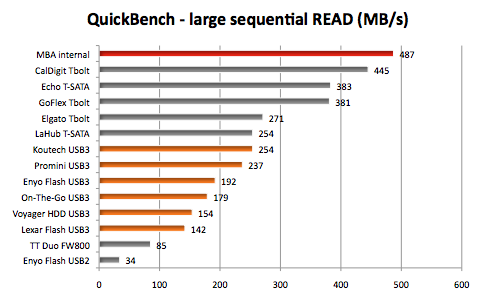 And none of them came close to the theoretical speed of USB 3.0. The "SuperSpeed" bus provides a transfer mode at 5.0 Gbit/s additionally to the three existing transfer modes. The raw throughput is 4 Gbit/s, and the specification considers it reasonable to achieve 3.2 Gbit/s (0.4 GB/s or 400 MB/s) or more. The fastest USB 3.0 transfer speed we've recorded is 275MB/s using the HPT RocketU Quad USB 3.0 host adapter on a 2010 Mac Pro connected to the Koutech ASU330 bridge. One adapter we didn't include in this round was the NewerTech USB 3.0 to eSATA adapter. You use it to connect an eSATA enclosure to a USB 3.0 port. It is capable of 200+ MB/s and it only costs $25. BOTTOMLINE: The addition of USB 3.0 to the 2012 Apple laptops is welcome (and long overdue).